I love reading blogs. Fitness blogs, mostly and blogs about blogging as well. I also have a few blogs that I love to read because the writer is a friend and I’d read almost anything they write. Point being, I read a lot of blogs. Not quite as many as I’d like to have time to read but I do read a number of them. But sometimes I stop reading a particular blog. Sometimes it’s because I’m just too busy. But other times I stop reading a blog because I’m annoyed. It doesn’t happen much, but it does happen. Read on for a few reasons why I stopped reading your blog (obviously not YOU because I love your blog :)). You never post regularly. If I visit your blog a few times over the course of a couple weeks and you haven’t posted anything, I’m peacing out. If you can’t be bothered to post (I get it, life happens), then I won’t be bothered to visit (because, life happens to me as well). Every post is sponsored. I have nothing against sponsored posts. I write them. I read them. I get that they bring money in – trust me, I get that. But if every other post is sponsored, then I am not actually ever getting enough from you to trust you enough to take your recommendations seriously. I actually really value sponsored posts from bloggers whose opinions I trust. But that trust is built up over time and through posts that aren’t sponsored. If I don’t get that from you, and all you post is sponsored, then I’m out. You never respond to comments. Again, responding to comments is hard. I know. I often am choosing between responding to comments and visiting a blog and commenting there. Usually I’ll choose to visit another blog. But I do read every comment I get and I respond to most of them. Sometimes it’s days later, but I make an effort. If you NEVER (I mean literally here) respond to comments than I’m not going to continue reading your blog. A failure to respond consistently is just rude. And I’m not down with that. Your blog does weird things on my phone. I read many blogs on my phone while commuting. If your blog can’t be read easily on my phone, I’m probably going to stop reading it. My reasoning is that now it’s so easy to make sure your blog reads easily on mobile devices – if you don’t do that, than I can’t be bothered. 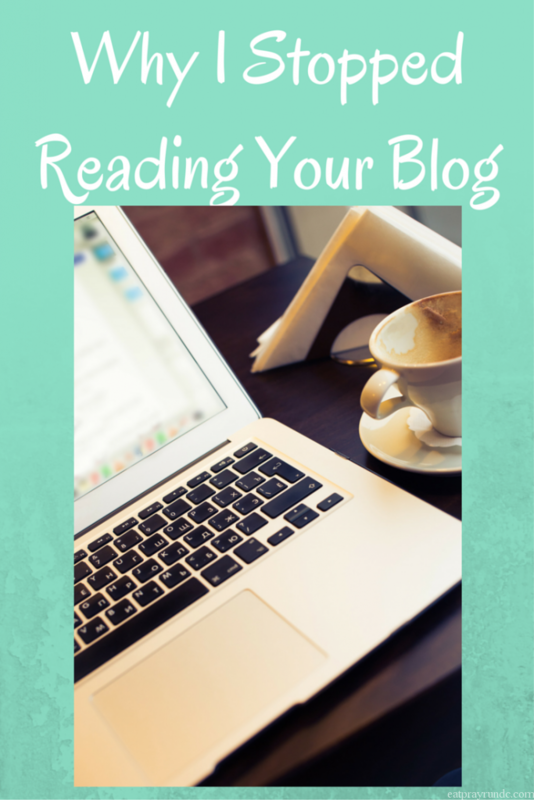 What makes you stop reading a blog?? Too many pop ups or overlays that block my screen. I read on my laptop 90% of the time and if I can’t see text because your twitter handle is over it, I won’t be back. If I have to close out a pop up every time I come to your blog, I’m going to get tired of it. If I wanted to be on your newsletter, I’d sign up at the bottom of a post – being forced to make the decision every time makes me crabby. Ha, understandable & I did not feel personally attacked 🙂 all super valid points!! I”m totally guilty of #1, but working on it 🙂 I stop reading blogs when every single post is sponsored-an occasional sponsored post is fine, but most of the time they sound so scripted. Makes me rethink the authenticity of the person behind the blog! Lol. Not you, lady! You know I you!!! Hahaha! I <3 you back! Number 2 – especially! I also stop reading blogs if visually it becomes difficult (for me) to do so – usually if the color contrast is odd (font color against background), text is center aligned vs. left aligned, or if the font is script. I will try, but will usually give up. Yes to all of these, but I have to add the annoyance of pop ups to my list. This is especially problematic when reading blogs on my phone. I understand the reasoning behind using pop ups, but I also really wonder if for the bloggers that use them if they really gain much benefit out of using them since I know that they also turn a lot of people away from their blogs. Just my two cents on pop ups. Kathryn @ Dancing to Running recently posted…I’ve Been Keeping a Secret – My 2016 Race Season Starts on Saturday! I’m okay with pop ups if they don’t cover my whole screen – if I can’t figure out how to remove them that’s a problem!!! #2 is my primary pet peeve. I really struggle reading blogs when the blogger “loves” so many different brands of shoes etc. I also will not subscribe to any blog by email. I already get plenty of emails I don’t want! I agree with too many sponsored posts. I also tend to side eye people who are brand ambassadors for ALL THE BRANDS. The #1 reason I will stop reading a blog is if their oh-so-inspirational advice is full of crap. Want to lose weight? Eat 900 calories a day. And you can only eat green things! Want to be a faster runner? Run ALL THE MILES even if you’re injured. 20 miles every day? No thanks, buh bye. I’ve also been known to stop reading blogs when blog takes on a different direction than when I first started reading it. A perfectly good running blog can morph into a wedding blog, then a parenting blog….sometimes I follow, other times I am just no longer interested. All of these things. Yes. Pop ups and excessive ads drive me crazy. Like Erica, if I want to sign up or subscribe I will, don’t need to be reminded very visit. I get it people want to make money but that’s not why I read blogs. I will also tune out if you start trying to give me advice like an expert on errrrything. Haha. Lol at your last sentence. Truth! Although I do appreciate tips & things that have been successful! I’m totally guilty of #1, especially when I started working outside of the home after 13yrs of being a SAHM. I made a vow to get back to blogging this year, my new job (yes, that’s 2 new jobs in 7 months lol) allows me more time at home. YAY! I am not very good at the whole reading blogs thing, especially when I get busy. Working on that as well. Basically I need to work on time management!! I love your blog, I may not comment all the time, but I try to read as often as possible. I also will not read a blog if it doesn’t work right on my iPad, which is what I”m on more than my phone or computer. I’ll also stop reading a blog if it takes me twenty minutes to read it because there’s a short novel tucked in there; although, I think I’m sometimes guilty of blabbing on-and-on, especially with my race recaps. Debbie @ Deb Runs recently posted…It’s Time For A Change, But What? LOL @ Debbie- I had the EXACT same thought when I saw this this morning. Like- man, I can’t NOTread this one. Fads. I stop reading if the person always jumps on the latest diet/shoe/workout/whatever trend. Until the next one comes along. And then they dump on the one they liked a week ago. And yes, not responding to comments is one way for me to stop reading, but mostly if you don’t have 100+ every post. Then I understand. I know almost nothing about blogging but am slowly working on my site. I haven’t checked to see if mine works well on my phone and I have no idea how to fix it if it doesn’t. For that, I think most people could get a pass. Newbs like me, anyways. Great post, and all valid reasons for why I would stop reading a blog. I’ve gotten more into reading blogs and really enjoy yours, so keep up the great work! I’ve had to stop reading some blogs because of the scripts for video ads will freeze up my browser. If I’m reading blogs during my down time at work, I can’t have my browsers freeze up because then I have to manually restart my computer. My computer does not like that one bit. I too stop reading if someone posts too many sponsored posts or fads. I don’t mind if a runner is sponsored by a company, but I hate when every post is the same… and has to do with that company. I don’t have any sort of sponsorship and it’s weird if I post that I like something, I feel like I need a disclaimer that “I’m not sponsored. I spent my money on this and really, truly like it”. The last blog I stopped reading because the person was increasingly negative. The whole race report was complaining about how she had a bad race, how all her races lately have been bad, how everything went wrong, and how even though she placed in her age group, she was not proud because it wasn’t a PR and she just wants to PR. I happened to read this when I was very sick and had to miss a race I’d signed up for. It broke my heart because I really wanted to RUN that day rather than being sick, even if it was not my best. I honestly don’t mind if someone posts infrequently. I feel guilty for not posting much lately but i’ve been busy with real life, work, and sick. I love blogging, I just haven’t had time for it. I totally agree with so many of these! I definitely tend to curse on my blog but I feel like I save it for when I really want to drive a point home 🙂 I also hate when a blog does funky things to my phone or it’s a hassle to comment BUT if I do comment and I never hear from the blogger after several comments? I’m OUT! Great post! #5 is the biggest one for me. I usually read blogs on my iPad, and sometimes they’re just impossible to read on a mobile device! The other big thing for me is when sidebar or other scripts freeze the site on my browser. Sometimes I have to switch browsers three different times to read a post, and that’s a lot of work! I’m less bothered by the lack of frequency – sometimes I feel like some bloggers are determined to stick to a schedule even when they’ve got nothing to say – I’ve dropped a few of those. I think too many sponsored posts and those constant pop-ups will send me on my way pretty quickly. Interesting post! Ah yes the rigid schedule can be problematic sometimes!! Thanks so much. All great things to think about. I try to watch the swear words. Or at least bleep myself. I also read blogs on my phone and many times there are so many pop up ads or “subscribe here” ads that make it impossible for me to read the blog cus the pop up covers my entire tiny screen! ( I actually have a blog post about this too. I just thought I would mention it cus I didn’t want you to think I was copying your idea. I’ll wait a while to post it though). When time is tight I also struggle with responding to my own comments or commenting on other blogs. I usually do well with responding early on in the day and then as you say, life happens and I don’t always get to respond back to the rest. I DO read them all though. I often wonder if people go back to the blog to check for a response. Do you? Of course if they are asking a question, I definitely try to respond in some way. Phew! I just caught up on responding to my blog comments. 😉 I pretty much agree with you. I also won’t keep reading a blog that’s too hard to read – either with small font, weird font, or too many flashy ads. Great post. I do most of my blog reading on my ipad and if a blog crashes or loads slow on my ipad, I can’t read it. I completely understand that bloggers have to make money but if they are shilling stuff that doesn’t make sense with their blog, it’s a huge turn off. Yes – these days your blog has to work on phones, iPads, etc! It’s a must! I am in complete agreement – and you know I love your blog 🙂 can not WAIT to meet in Chicago!!! Great post! The top reasons I stop reading a blog are many of the reasons you listed, plus when the blog I liked becomes a completely different blog. For example a food blog turning into a baby blog. Another pet peeve of mine, mostly with food blogs, is when there are 50 pictures in one post of the exact same dish, just taken from slightly different angles. Ads that make it hard to read! Also if it does not perform well on mobile devices. I stopped reading a blog because on every.single.page there would be a pop up asking me to subscribe to posts. I get that that can happen when we visit it once, but every.single.page. It is so annoying to have to close the box. Ugh. I completely agree about replying. If I comment 4 or 5 times and that person never comments on my blog or replies, I stop reading. Aw I hope you still read my blog! But I totally get all those reasons for not reading a blog because I follow them, too. If I can’t easily navigate, I’m out. It doesn’t have to be on my phone but if it takes forever loading or there are a million popups, forget it. I do grapple with the sponsored posts, though, because like you said, it does bring in some money. It seems like all my sponsored posts have been back to back lately, which is something I try to avoid because of your exact reasoning. I much prefer to spread them out if possible. My biggest pet peeve on a blog is when you get a requirement to sign up for a newsletter to read the blog. Ummm… no, thanks! I’ll pass. GREAT post! I stop reading blogs when it is the same content over and over and over again. There are only so many times I can read about the same thing over and over and over again. Smitha at Running with SD Mom recently posted…#FridayFascinations: Things I am Loving This Week! YES to the popups. Sometimes I get into an endless clicking fest on Twitter discovering new running/fitness blogs. If I’m on my phone many times the subscribe for this/that/the other will take up more than half, and sometimes 90% of my screen. If I can’t figure out how to get rid of the popups, out I go!